Pole-moontit distreibution transformer wi center-tapped seicontary windin uised tae provide 'split-phase' pouer for residential an licht commercial service, which in North Americae is typically ratit 120/240 volt. 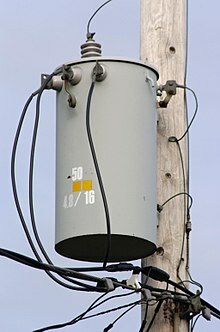 A transformer is a static electrical device that transfers energy bi inductive couplin atween its windin circuits. A varyin current in the primary windin creates a varyin magnetic flux in the transformer's core an thus a varyin magnetic flux through the seicontary windin. This varyin magnetic flux induces a varyin electromotive force (emf) or voltage in the seicontary windin. Transformers can be uised tae vary the relative voltage o circuits or isolate them, or baith. Transformers range in size frae thumbnail-sized uised in microphones tae units wichin hundrits o tons interconnectin the pouer grid. A wide range o transformer designs are uised in electronic an electric pouer applications. Transformers are essential for the transmission, distreibution, an utilization o electrical energy. This page wis last eeditit on 25 Mairch 2015, at 04:06.